A ground fault circuit interrupter is an electrical device installed to protect against severe electric shocks. GFCI’s could also reduce electrocutions and minimize electrical burns and shock injuries. A GFCI, not to be confused with an AFCI, integrates a ground fault protection in receptacles where electrical equipment is near water or might be in contact with water. Ground fault circuit interrupter also detects ground faults and interrupts the flow of electric current. A GFCI is not and might not be used to replace a fuse and does NOT protect against circuit overloads, short circuits, or shocks. A normal 120-volt outlet has two vertical slots and a round hole just below them or to the sides. Usually, the left slot is larger than the right, and it corresponds to the neutral while, the right slot is called hot. The round hole is the ‘ground’. When the outlet is working properly the electricity is flowing from hot to neutral, and that’s when the GFCI enters into action. The GFCI measures the amount of current flowing from hot to neutral, so the circuit can trip and shuts off. When properly installed, a GFCI can detect variations as small as 4 milliamps, and it trips quickly, less than a second, cutting off electricity. Portable GFCI protection could also be required whenever electrically-powered equipment is used in garden-related works and when using electric tools in and around the house. GFCI’s can be found in three different ways. The most common one is the GFCE receptacle, very similar to a common wall receptacle, very cheap and easy to install. The portable GFCI can be plugged into a standard outlet providing the protection needed while the temporary one is an attachment plug that can be used to provide the desired protection but will not substitute the requirements of a permanent one. When used outdoors the portable and temporary one shall be waterproof and indicated to use outdoors by the manufacturer. In some cases, GFCI’s will trip but does not mean that there is something wrong with the installation. If the GFCI is installed in circuits longer than 100 feet, could be one of the reasons your interrupter is tripping. Another issue can occur when the circuit has many splices, fluorescent lighting fixtures or permanently installed electric motors as this can cause the GFCI to trip. Before installing a GFCI, the loss of power might be considered when using the protection with freezers, garage door controls, and others. 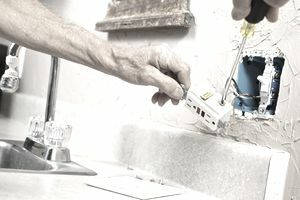 Be aware that during the installation the lines and/or loads are properly landed to ensure that the device will work properly, if not, the GFCI will not reset, so make sure the connections are right. The GFCI is not the same as the ACFI. The AFCI is used to address fire hazards, while GFCI is installed to prevent shock hazards. We expect soon to have combination devices including both AFCI and GFCI protection in one single piece.